Why did I read the book: We always try to support small publishers and given how one of the stories was a Stoker award finalist, we were more than happy to say yes when contacted by the publisher. I am the one reading it as part of my Halloween week homework. 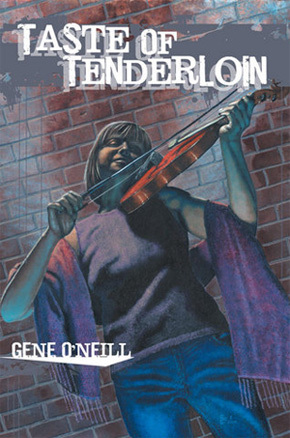 Summary: Eight stories of dark science fiction and fantasy weave a path through the underbelly of San Francisco’s most notorious district in Taste of Tenderloin by Gene O’Neill. Best known for his strong sense of place and uniquely vibrant characters, O’Neill brings the gritty underside of the city to life with eight interwoven stories of broken lives, missed dreams, and all that can go wrong with both reality and fantasy among the down and out. The city itself opens wide to swallow all comers with the temptation of its secrets and sins, while O’Neill brings dignity and humanity to a set of characters often overlooked in both society and fiction. Review: Taste of Tenderloin is a collection of short stories by horror writer Gene O’neil all set against the backdrop of the Tenderloin District in San Francisco; there are eight stories altogether, some of them never published before, all of them dark tales following around a few denizens of the ‘Loin. The anthology is quite diverse in its offering with stories that range from the fantastic to the hauntingly realistic but all of them have something in common: the ugly, brutal life in the streets of the district. They are much less frightening than I expected them to be as instead of gritty horror, we are confronted by characters steeped in and suffering the consequences of poverty, crime, homelessness, addiction – which may not be scary but certainly is horrific. The description of their environs is quite vivid, as the characters walk the streets of the ‘Loin, brushing shoulders with petty criminals, prostitutes, drug addicts, war veterans. Even the stories that have a Sci-Fi or Fantasy twist to it are still very much within a certain realm of possibility depending on how the reader approaches the tale. Quite frankly, reading these stories, reminded me of the X-Files’ Monster of the Week episodes in which two possible outcomes coexisted and I had a Mulder sitting on my left shoulder telling me to believe and a Scully sitting on the right side telling me that these characters are suffering from Post-traumatic Stress Disorders, drug induced hallucinations or withdrawal syndrome. One such story and one of my favourites is Balance in which a veteran goes around killing people in order to maintain the Law of Catastrophic Isostasy ,a mission he believes is given to him by Lady Justice. This story is batshit insane and it does not surprise me that it has been nominated for an Award. Similarly impressive are The Apotheosis of Nathan McKee and Bushido , the former relating the change in the life of main character who becomes invisible after a beating , the latter describing how an Ugly Man is given a second chance to follow The Way of the Warrior. I also very much enjoyed the first one, Lost Patrol about a Vietnam veteran who is visited by the ghosts of his former patrol and Magic Words who presents a gypsy and Pact. In keeping with the TV themed comparisons, these two reminded me of short-ish Twilight Zone episodes. The first story, Lost Patrol even opens and closes with a narration that I could easily picture Rod Serling’s voice, over it. Overall, I liked the experience of reading these tales, even if I am not a horror fan. These are all sad stories of characters stuck in a rut, some of them being able to escape (regardless if you believe in the manner in which they escaped or not) some sinking further into their fortunes. Verdict: This is a good anthology, with diverse characters and stories and a balanced mix of realism and fantasy. Rating: I am wavering between a 6 and a 7. Most stories were Good. Some were Very Good.